T-Mobile gives customers rock star status with a Team of Experts dedicated just to you. No bots. No bouncing. No BS. This Un-carrier move ends the biggest customer service pain points: the hated phone menu & the call center runaround. The best customer service in wireless just got better. Charleston, South Carolina – August 15, 2018 – Real customer service takes real people. T-Mobile (NASDAQ: TMUS) today launched T-Mobile Team of Experts nationwide and turned traditional customer care on its head. T-Mobile’s latest Un-carrier move takes aim at the biggest pain point yet – the old, broken customer care model that has frustrated Americans for decades. With Team of Experts, when you call or message T-Mobile, you get a tight-knit team dedicated to you and others in your city. There are no robots or automated phone menus. No getting bounced around from department to department. No shouting “representative.” You now have your own entourage at T-Mobile dedicated to you and your happiness. You can even see a photo of your Team of Experts in the T-Mobile App on iOS and Android. And, T-Mobile also announced that your rock star status extends beyond the Un-carrier with upgrades at Live Nation shows and with Pandora music. T-Mobile Team of Experts is a radical re-invention and changes everything about the customer experience by putting people first. When you call or message, you get straight to a team dedicated to you. 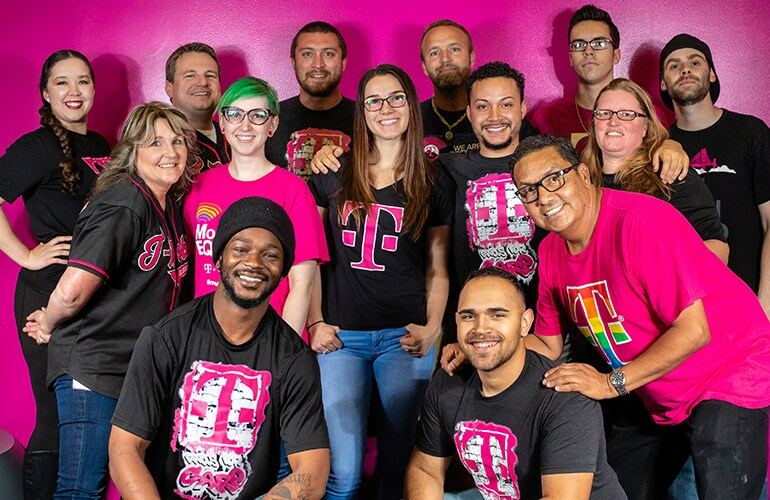 Rather than investing in avoiding customers with bots and automated phone menus, the Un-carrier is making a huge investment in serving customers with highly-skilled, highly-motivated people. The end of robots and phone menus – T-Mobile is killing the automated phone menu. You’ll never be forced to talk to a robot, IVR (Interactive Voice Response) or machine again – unless you just want to! When you call or message, you’re routed straight to your Team of Experts, or you can tell your team when to call you. The end of the call center runaround – Traditional call centers randomly route you to reps who are overly-specialized to solve just one kind of issue and goaled on Average Handle Time (aka how fast they can hang up or transfer you). That means customers get bounced from department to department, forced to repeat themselves over and over. With Team of Experts, you’ve got people dedicated to you and your happiness, and they’re highly-trained to handle a wide range of topics, sometimes working with specialists including local retail and engineering to solve even the most complex issues. The end of being told when and how you can get help – Most brands tell you how and when you can reach them. At AT&T and Verizon, forget calling outside of office hours … they won’t pick up. Team of Experts is on your terms -- you can call 24/7, schedule a call-back and soon, just ask Alexa or Google to have your Team of Experts call you. Plus, the Un-carrier has launched asynchronous messaging for all T-Mobile customers in the T-Mobile App and iMessage. Instead of waiting for a rep, you are in control. Message your Team with an issue, and they’ll get right to work on it. But you don’t have to wait. Come back to it whenever works for you. Team of Experts is now live for T-Mobile postpaid customers for free and is being rolled out to every business and public-sector customer, too. Customers can reach their team however they want, but the optimal way is to call 611 from your T-Mobile phone or message from the T-Mobile App or iMessage using Apple Business Chat. Customers are fed up with traditional customer service. 80% of customers aren’t satisfied with how businesses respond to their problems, and no wonder – today’s customer service experience is a maddening mess of navigating phone menus, talking to robots, listening to bad hold music and getting bounced from department to department, repeating yourself over and over again. 90% of consumers say they never want to talk to an IVR – at all.1 Yet, brands spent $3.73 billion on this hated technology last year.2 And, once you get through the automated phone menu, get ready for a LOT of instrumental soft jazz – the average American will waste 12 days on hold with customer service throughout their lifetime.3 Once you finally reach a human, nearly 40% of calls in wireless are transferred,4 forcing you to start the cycle over again and repeat yourself to the next rep.
Once you’ve navigated the customer support maze and are finally talking to the right rep, it’s entirely transactional – because that’s the cheapest way for corporations to handle you. So, the second you hang up, that rep is done with you...maybe forever. If you call back, you start the maddening process all over again. This is how most companies today define “service.” Not so, with Team of Experts. In a time when most brands are mechanizing customer interactions with bots and artificial intelligence, T-Mobile is investing in people. You call, you get a smart capable human, and your Team of Experts has all the people needed to solve most any issue. Yes, T-Mobile just made the best service in wireless even better. The Un-carrier spent over two years testing and optimizing Team of Experts with smaller customer groups and businesses before launching nationwide today. Those early results are incredible! With Team of Experts, Net Promoter Score (NPS) – or likelihood to recommend -- increased an unprecedented 56%,5 putting T-Mobile on par with other brands famous for their customer care. Two weeks ago, the Un-carrier also received J.D. Power’s highest score EVER given in full-service wireless customer care – yet again. That’s right -- the “Highest in Customer Service among Full Service Wireless Providers, Two Times in a Row.” And that’s all before today’s nationwide Team of Experts launch! With Team of Experts, T-Mobile invested even more deeply in making customer care a true career – with more training, more opportunities for advancement, more empowerment to do what’s right for customers, customer-focused incentives and redesigned physical spaces that look more like Valley startups than phone bank cube farms. And the Experts love it – in fact, T-Mobile customer experience centers were named a best place to work 18 times, just in 2017 alone! Turnover in T-Mobile’s care team is down a remarkable 48% in the last three years, and the company has an incredible 90% internal promotion rate in customer care. Because nobody else is doing care this way, T-Mobile had to create a radically different model…and Team of Experts is a big investment that’s paying off big time. In Q2 of 2018 – even before Team of Experts went live nationwide today – customer service costs for postpaid were the lowest in company history due to fewer calls per account and callbacks – making Team of Experts a win, not just for customers and employees, but for shareholders, too. Because Team of Experts is such a win for customers, employees and shareholders, T-Mobile also announced that they’ll share the Team of Expert blueprints to help other companies (ahem, AT&T, Charter, Comcast, Verizon) adopt the revolutionary Care model. That includes licensing several patent-pending technologies for free to anyone who commits to Team of Experts for all their customers. Because every customer of every product or service deserves to be treated like a rock star. For more about Team of Experts, visit t-mobile.com/teamofexperts. Team of Experts is for our postpaid wireless customers.